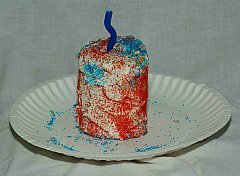 Kids 4th of July recipes. 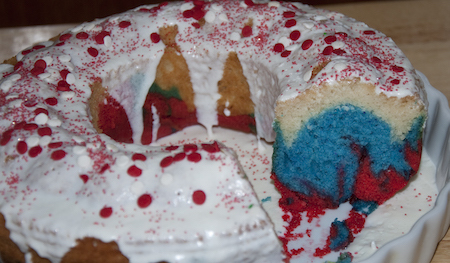 In celebration of America's Independence Day, we've compiled some Kids 4th of July recipes. 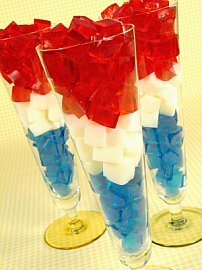 Whether it is a main dish, salad or dessert it all starts with festive red, white and blue patriotic recipes. Mix fruit together and serve in a hollowed out watermelon. Right before serving stir lime juice and honey together in small bowl and drizzle over top of fruit salad. 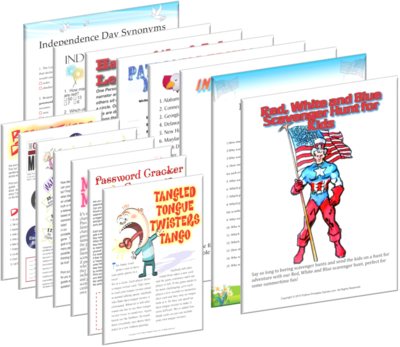 A simple kids 4th of July recipes that they can put together themselves. 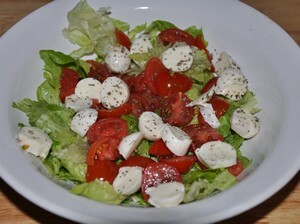 In serving bowl toss cherry tomatoes, parsley and mozzarella cubes. Sprinkle with olive oil and season with salt and pepper. Melt candy melts in a microwave safe bowl in the microwave and stir every 30 seconds until completely melted. Dip ends of pretzel sticks about halfway up the stick. Sprinkle with sprinkles. Set on waxed paper and allow to chill several minutes until sets. In a glass bowl layer parfait in order starting with blueberry yogurt and sliced strawberries. Sprinkle with cereal and top with cool whip. A perfect 4th of July recipes for kids to put together and snack on while the barbecue is cooking. Have an adult help with chopping vegetables. Stir ingredients together and place in serving bowl. Arrange chips along side salsa. 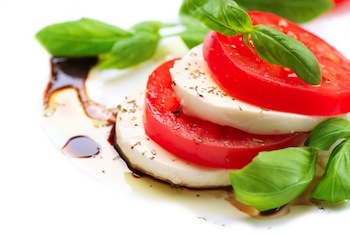 Looking for main dish recipes or typical American cuisine? Check out our American recipes here. Make biscuits or homemade rolls and cut out with a star cookie cutter. Make blue or red popsicles. To make a double layer fill half full with one color and freeze. Then add another layer, refreeze. Make red or blue punch with Kool-aid. Top each glass with sliced strawberries. Place a raspberry in each hole of an ice cube tray. Fill with lemonade. Freeze. Add to blue punch. Make a vegetable dip and pour into hollowed out red peppers. Serve with cut vegetables and crackers for dipping. Make normal Kraft macaroni and cheese. Before you add the cheese mix put blue/red food coloring on the noodles. Then add the cheese. If it looks green (for the blue) Add more blue. Keep adding color until it looks blue. Have a glass of white milk to drink. Then have strawberries or anything red for a side dish. This makes a wonderful lunch. 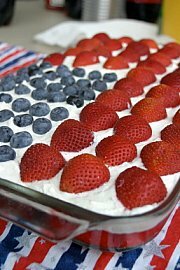 See more red, white and blue food ideas. 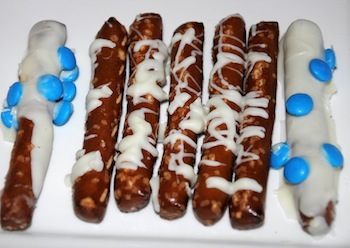 More fun 4th of July Food ideas here. 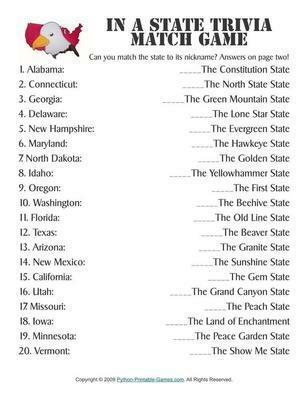 Test your United States knowledge with these printable games. Choose a can that doesn't have a lip extending over the opending of the can. This will make it hard to get your cake out in one smooth piece. Clean out empty soup cans and grease well with shortening and flour. Prepare cake mix and pour into cans about 2/3 full. Bake until toothpick inserted comes out clean. Allow to cool. With a knife loosen cake from edges of can and cake should slide out. Decorate sides and top of cake as desired. 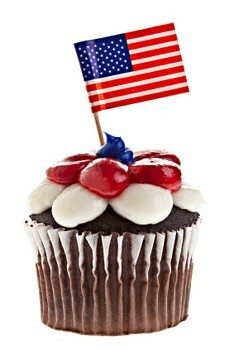 Decorate 4th of July cupcakes with star picks, flag toothpicks or other cake toppers. Prepare cupcakes and allow to cool. Frost with white frosting. Cut red licorice into 2-3 inch pieces. Poke throughout top of cupcake. Bake a white cake in a 13x9 pan according to directions. 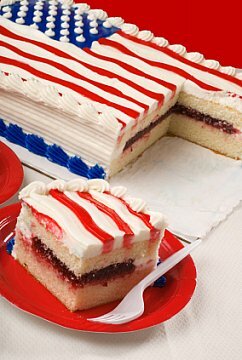 Allow to cool and with a toothpick score lines across cake and a square in the top left corner just as you would see on an American flag. In the top left corner place rows of blueberries. Align strawberries on the top row. Place white frosting in a ziploc bag and cut the corner off. (or use a pastry bag) Squeeze white frosting after the strawberry row. Fill cake rows alternating rows of strawberries and rows of white frosting to resemble the red and white stripes on an American flag. *Alternately you can frost the cake with cool whip and place berries on top of the whip cream, as the picture. 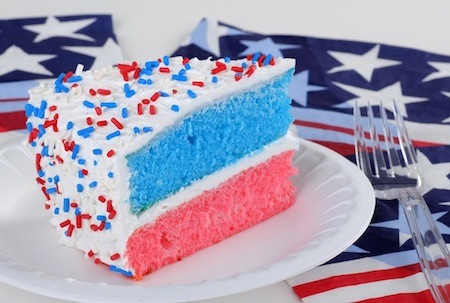 Frost a a layered sheet cake with colored frosting to resemble the flag. Using berry filling for your cake makes a nice red color to the inside. Divide your cake batter into three bowls. Add red, white and blue coloring, one color per bowl. Mix together. In a greased pan, swirl drops of colored batter. Bake. A similar idea is to color your round layers a different color then fill and frost with white frosting for the finishing touch. 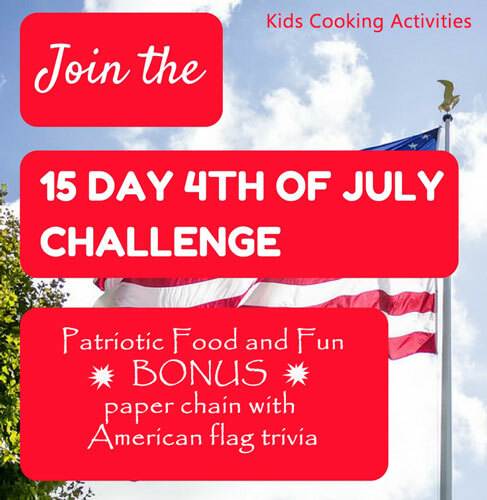 Do you have a Kids 4th of July Recipe?